Reaper’s Mark Time! If you successfully completed the Reaper’s Run of Wanderer’s Refuge earlier this month, you know the drill. 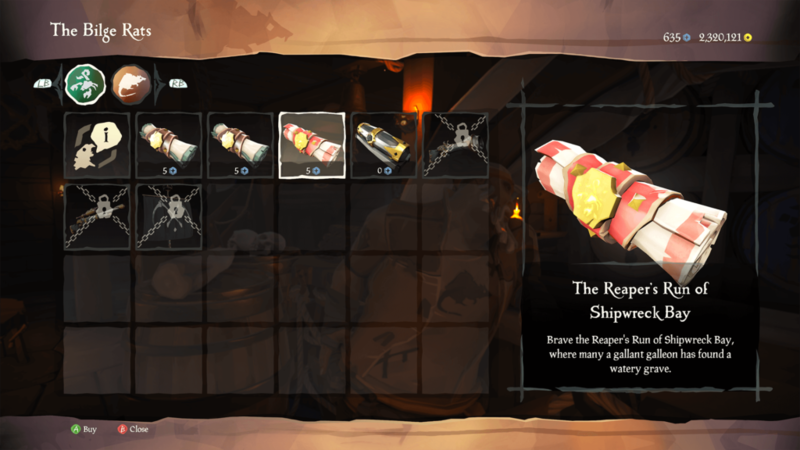 If this is your first Reaper’s Run—or if you are simply looking for a refresher—we have everything you need to know about this latest voyage, which will have you getting very familiar with Shipwreck Bay. In any tavern, you’ll find your friendly neighborhood Bilge Rat, Duke. Duke will have a whole new batch of voyages in his inventory to purchase. Alongside two new Mercenary Voyages, he is now offering the Reaper’s Run of Shipwreck Bay. As before, you will need to purchase this voyage with doubloons. Don’t fret! The commendations attached to completing this voyage will grant you a hefty amount of doubloons in return. Purchasing the Reaper’s Run of Shipwreck Bay will cost you 5 doubloons, but you will unlock 20 doubloons for your first completion of the voyage—Reaper’s Mark flag raised or not. If you’re going after the Legendary commendation, you’ll need to complete the voyage five times with the Reaper’s Mark hoisted. At 5 doubloons per voyage, this will cost you at least 25 doubloons. While that sounds like a lot, it will unlock 50 doubloons on completion of the last Reaper’s Run voyage needed. Plus, only one crew member needs to purchase the voyage. So, if you’re sailing with other pirates, you may only need to purchase one or two voyages yourself. As with the previous Reaper’s Run voyage, you will be completing five chapters of quests to complete The Reaper’s Run of Shipwreck Bay voyage. The three X-Marks-the-Spot quests will be on Shipwreck Bay. 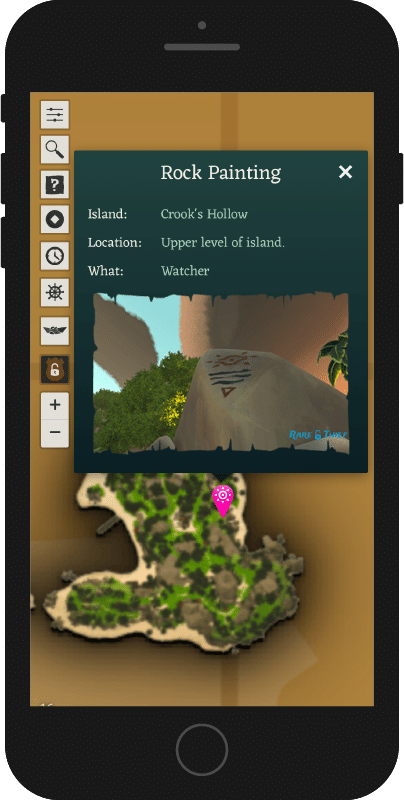 The two riddle quests will be on nearby islands, such as Crook’s Hollow or Snake Island. Reaper of Shipwreck Bay Commendation. 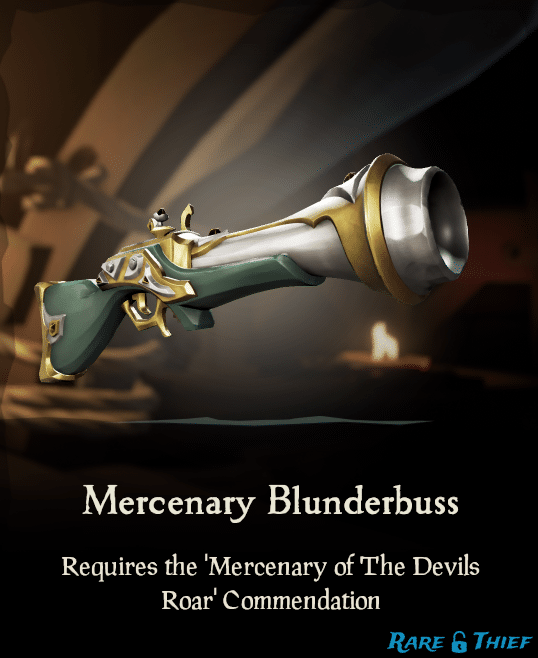 To unlock the Legendary Reaper of Shipwreck Bay commendation, you will have to complete this Mercenary Voyage 5 times while flying the Reaper’s Mark flag. This Legendary Reaper of Shipwreck Bay commendation will grant you access to purchase the Shipwreck Reaper Sail! 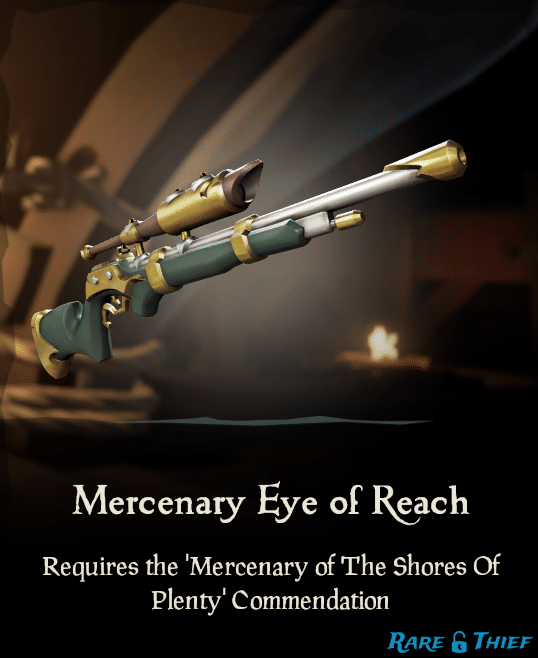 To unlock the other two cosmetics, the Mercenary Eye of Reach and the Mercenary Blunderbuss, you will need to complete The Shores of Plenty and The Devil’s Roar Mercenary Voyages. What does this Reapers Mark flag even look like? Ah, yes. Recognizing this symbol on the high seas is of some importance. What’s so special about this Reaper’s Flag? This is why recognizing the reaper’s symbol is quite helpful. When a ship raises its reaper’s mark flag, that ship becomes visible to all other ships on your server. How? 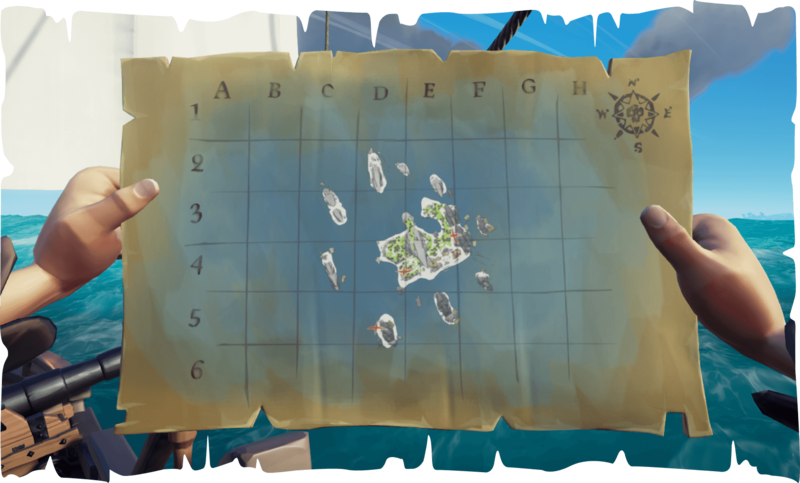 Go to your ship’s map table, and scroll around the map. If a ship has its reapers mark flag hoisted, it will look a bit like the picture below. If the ship is outlined in white, never fear. That would be your ship. If the ship is shrouded in shadows, beware. How do I use this Reaper’s Flag? Climb to the top of your crow’s nest. There you’ll find your “ship flag box.” Open the box, scroll to the reapers mark flag, and select it. 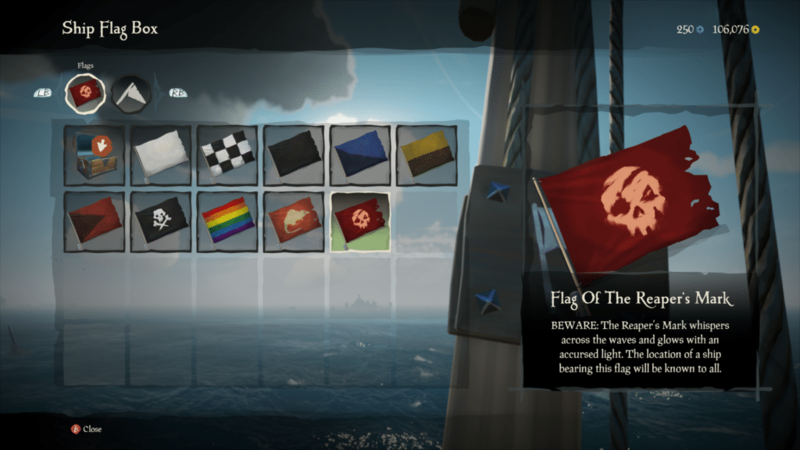 You must go to your crow’s nest and equip the Reaper’s Mark flag before you vote on the voyage. You must also keep the flag up at all times during your voyage. Only lower it after you have completed all the chapters of the voyage. As the voyage name suggests, your first destination will be Shipwreck Bay. Here, you’ll begin with an x-marks-the-spot quest on Shipwreck Bay. 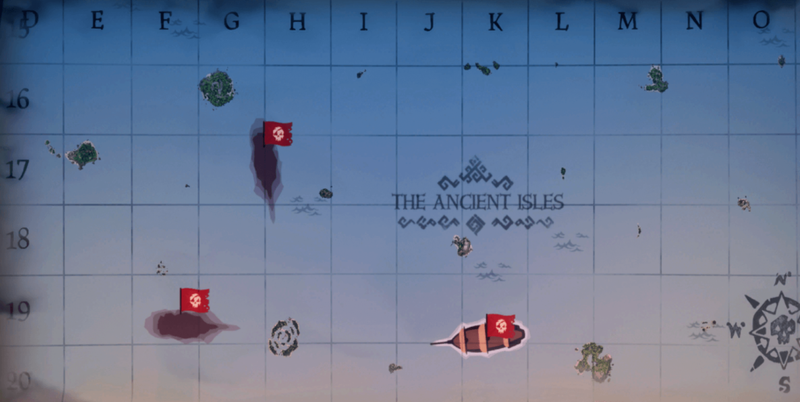 This means you’ll have a map of Shipwreck Bay branded with three red X’s. Use your map and compass to locate each X, and dig right on that spot. When your shovel finds the right spot, you’ll hear a nice “clunk”—the beautiful sound of buried treasure. Digging up the third and final chest on the map will have you moving on to Chapter Two of this voyage. Later in the voyage, you will return to Shipwreck Bay. For now, you will be headed to another island, with another quest in store. Chapter Two is a Riddle quest on a neighboring island—most likely, Crook’s Hollow. 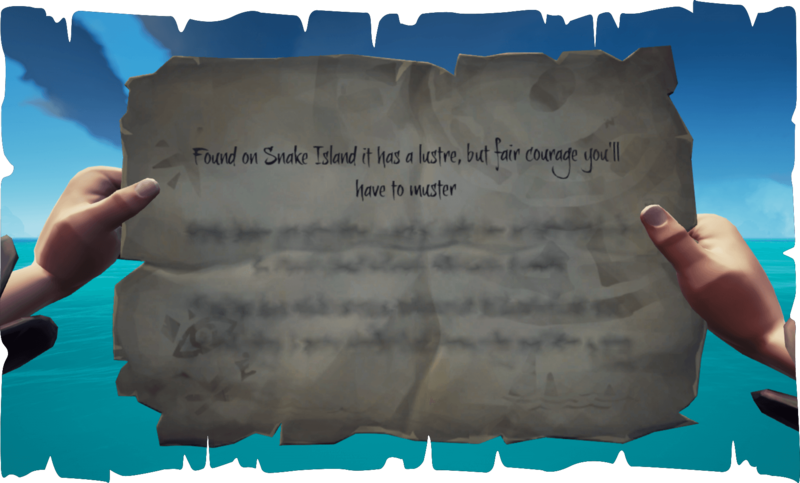 For riddle quests, you are given 1–4 tasks, which must be completed to find your buried treasure. What must you do in each task? Well, that is stated rather plainly in your riddle. For example, it’s not too difficult to decipher that “sing a shanty” wants you to play an instrument. Where must you do each task? Ah, now there is the riddle. Landmarks and rock paintings litter the islands. 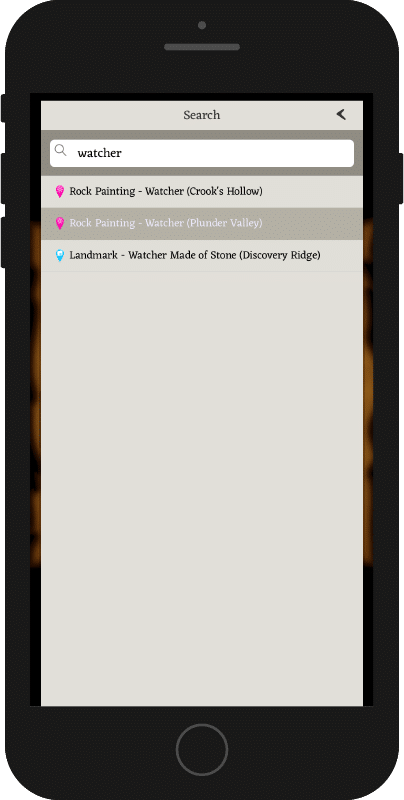 You’ll need to determine which landmarks and rock paintings have significance for your particular riddle. Some of these landmarks and rock paintings can be hard to find. If you get stuck on a riddle, you can always open your trusty interactive map. Even though you might be tired of running around the island blindly, you might still want to explore the possible riddle sights yourself. 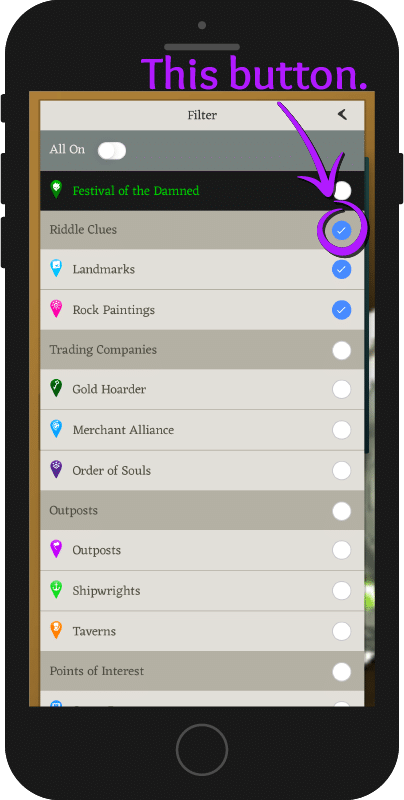 If so, simply toggle on all riddle clue markers (landmarks and rock paintings). That way you can click each marker to assess whether it seems to match your clue. However, if you’ve exhausted the running and exploring, and you simply want to know where this confounded clue resides, you can always use the search feature. For example: what in the name of Poseidon is the “watcher” on Crook’s Hollow, and where is it? Click on the icon, and type “watcher” into the search. Tap on your search result, and a marker will appear on your map. Zoom in on the marker to determine its location with pinpoint accuracy! Tap on the marker to see an image of the “watcher.” This will help you know exactly what you are looking for. Your small trip away from Shipwreck Bay has come to an end. Head back to Shipwreck Bay. You now have 6 chests to dig up—and they’ll likely be chests well worth the dig: mostly captain’s chests, and maybe even a few cursed chests here and there. Don’t get too comfortable on Shipwreck Bay. You are now onto your second Riddle quest. 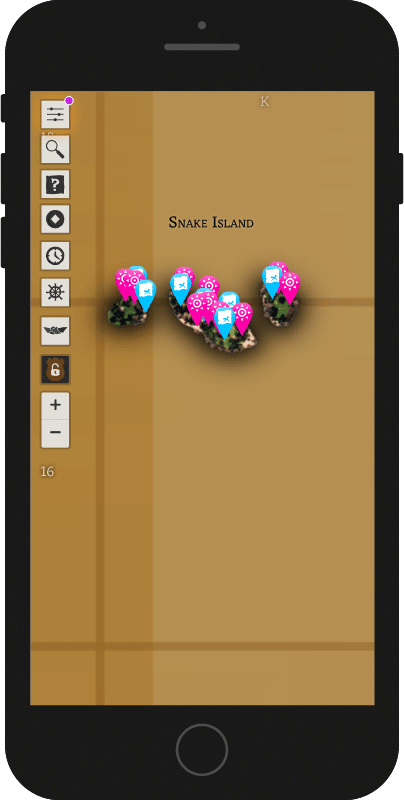 Head on over to the island listed on your Riddle map—most likely Snake Island—and start scouring the island for those clues! Again, if you just can’t seem to find a clue, you can always sneak a peek at your interactive map. You made it! 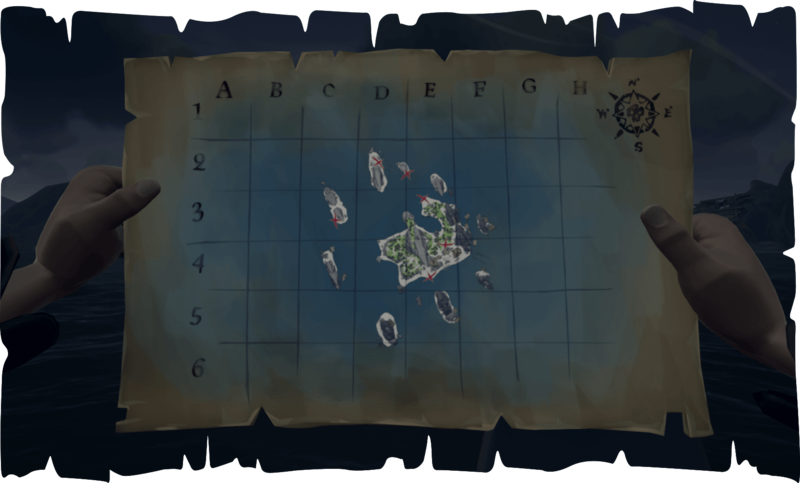 The fifth and final chapter of this voyage is one final x-marks-the-spot map on Shipwreck Bay. You’ll likely know your way around the island quite well at this point. On this your final quest, your map will divulge the location of 9 final—high-value—chests! Huzzah! You’ve now completed the Reaper’s Run of the Shipwreck Bay! If you hoisted your reaper’s flag before you began, you’re also 1/5th of the way to your Legendary commendation. Dare to do this voyage four more times, and you’ll roam the seas with your new Shipwreck Reaper Sails billowing in the wind. Did ye think the Reapers Voyage for Shipwreck Bay be the only exciting Sea of Thieves news today? Shiver me timbers! 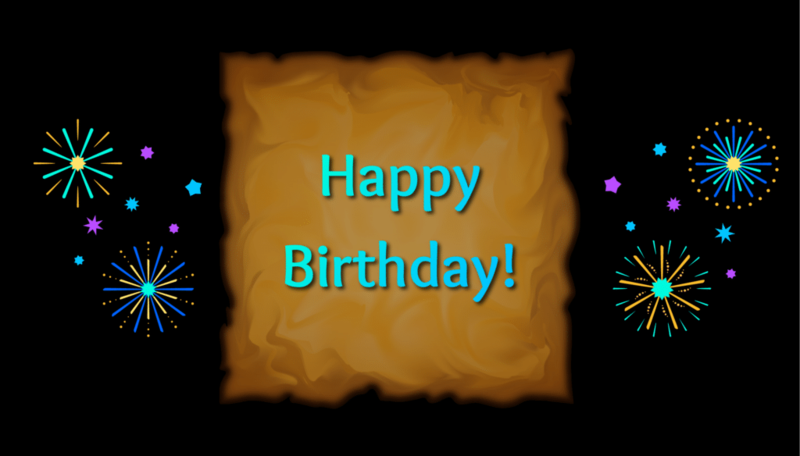 Today be Sea of Thieves’ first birthday. To commemorate this day, Rare be releasin’ an anniversary video with tantalizin’ tidbits about the Mega Update soon to come! 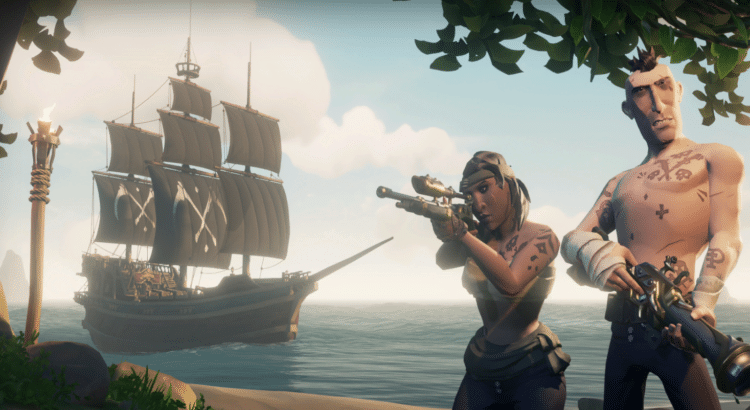 The following article be givin’ ye a link to the original video, a review of the video’s highlighted features, and a few thoughts on what these features might be meanin’: Sea of Thieves Anniversary Update. There be whispers in the wind—or in the taverns really—from those who claim to have made this very voyage. Perhaps it’s all bluster. Perhaps these pirates only be tellin’ ye tips ye already know. Then again, perhaps these are worth mentioning lest you—or an otherwise seaworthy crewmate—forget a few minor details when gold be on the horizon. You must have your Reaper’s Mark flag up during the entire voyage to get credit for the legendary commendation. This means you do not want to put up your alliance flag—this means neither the “offer alliance” nor the “join alliance” flag—because this will take down your reaper’s flag. However—understandably—you might want to try to form an alliance; it might keep vulture pirates at bay. If so, since the starting island is Shipwreck Bay, it might be wise to sail to the island before voting for the voyage. Once you’re at or near Shipwreck Bay, keep a weather eye out for other ships. If they don’t already have their reapers flags up, you might try to form an alliance. They might be just as keen to know that the at least one other ship on Shipwreck Bay is friendly. Once you are in an alliance, you can raise your Reaper’s Mark and vote on the voyage. As mentioned above—if you are going for the legendary commendation—your reapers flag will be flying high. This means your ship will appear on the map table of every other ship on your server. Perhaps the other ships will pay you no mind. After all, other ships might take advantage of knowing where you are to complete mercenary voyages, skeleton ship battles, or skull forts in relative peace. Then again, you might the seas filled with pirates whose sole mission is to thwart the success of anyone attempting the reapers voyage. If you’d like to increase your chances of turning in the chests you dig up, you might consider a maintaining a lookout. You can designate one crew member, or your crew can take turns. Your lookout can stand in the crows nest, or find a high point on the island with a 360º view. Whatever your method, it helps to know that at any given moment at least one person has an eye on that horizon. Parking might be a bit difficulty at Shipwreck Bay. Firstly, it’s not called “Shipwreck Bay” for nothing. The island’s rocky—and sometimes surprisingly shallow—outskirts are not the easiest to navigate. Secondly, all the good spots might be taken. After all, you might not be the only pirates trying to complete the Reaper’s Run Voyage. 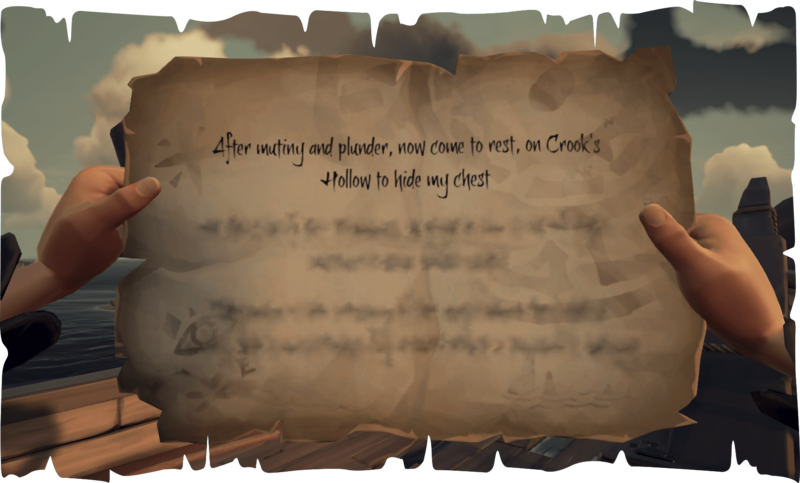 Whether you complete the x-marks-the-spot all together or entrust the task to one or two crewmates, you’ll need to discuss what to do with the chests. If you’re more concerned with the commendations and the Shipwreck Reapers Sail than you are with earning gold from the captain’s and cursed chests you find—you could simply have your crew dig on each X just once. This means you don’t spend time digging the chests all the way up, fighting the hostile mob of explosive-barrel-wielding skeletons, or hauling each chest back to your ship. Make one dig on the “X,”—hearing the sweet “clunk” of discovered treasure—and you will have completed that “X” on your map. You’ll know you’ve completed the “X” if it disappears from the quest map. 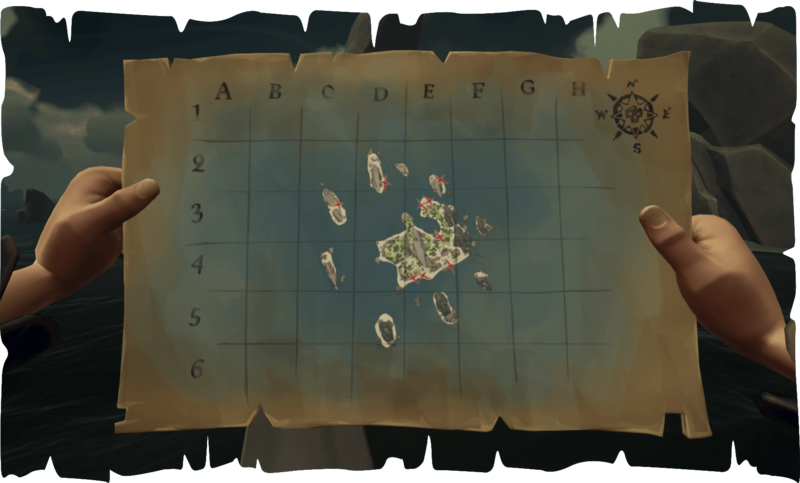 If you do this for every “X” on your map, you will trigger the next chapter and can continue your voyage. Alternatively, you could fully dig up your chests, then hide your chests in spot next to which you can closely park your ship—or rowboat—for quick loading and a quick escape! Obviously, this is helpful if you’ve left a crewmember or two on the island and your ship is nowhere near when the chests are dug up. However, it is also helpful even if your ship is parked on the island and all crewmembers are digging together—as is likely the case when you are on your final map. If you’re putting chests on your ship as you dig them up and then going back out to dig up another chests, the chests on your ship are awfully vulnerable. If, instead, you hide your chests near the coast line, they’re far more secure. That way, if hostile pirates get the best of you, at least they might not get the best of your treasure. Once the coast is clear, you can sail back and seek out your hidden treasure. There you have it! 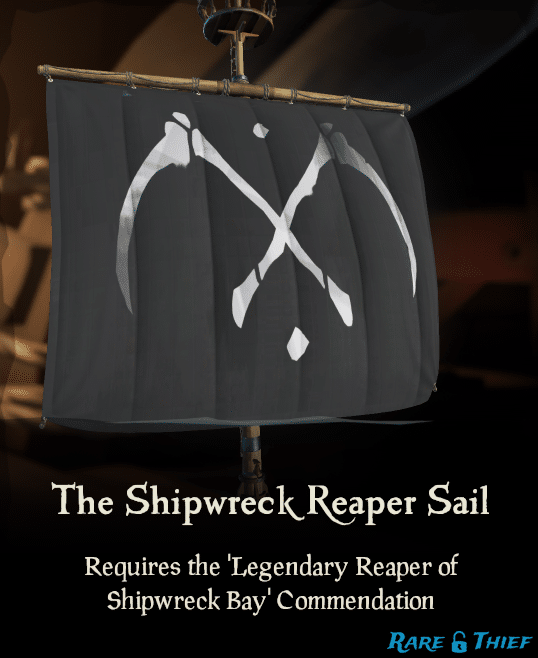 You should be all set to add the Shipwreck Reaper Sail to your collection. If you stumble upon any unanswered questions, feel free to ask in the comments below. Fair winds, me hearties!